The fourth area that must be developed, in order for our young people to keep the faith, is heartfelt expressions of worship. The second definition of worship is “to be in awe of.” This definition goes beyond outward expressions and identifies the very reason for those expressions. Awe is what happens when you hold your newborn child for the first time or look up at the billions of stars in the sky. Awe causes an exhale of almost disbelief when convicted by the obviously awesome nature of God. Only when a heart is so filled with admiration and affection that words seem inadequate is it truly ready for sincere expressions of worship. Perhaps the reason young people are deserting the church in such alarming numbers is because the church is failing to encourage their awe. We offer them expressions of worship (to kiss toward) but fail to engage their hearts in expressions of worship (to be in awe of). Since worship is not simply an event, but rather an acknowledgement that is born from an attitude of humble dependence and overwhelming appreciation, the church must make it a primary objective to foster an atmosphere that promotes these expressions of "awe!" Some time ago, I was approached by a very discouraged youth leader. He had just returned from a church event for small children. He explained that during this event the youngsters were discouraged from singing "devotional songs" that included hand motions or clapping. Some of the adults felt that these songs lacked spiritual substance and the motions were unholy. During each assembly of the little children, songs were sung out of the ancient, "traditionally correct" hymnals and a preacher lectured to them for over an hour. The discouraged youth worker went on to explain that when the children lost interest they were reprimanded. At one point, the children became so bored and so disinterested with the adults’ definition of worship that, when they failed to pay attention, their favorite recreational privileges were taken away. Sadly, this does not just happen at youth events. This tragedy occurs every week in church services all around the world and will, perhaps, even happen again this week in the service that you attend. The tragic story above illustrates far too well what we have done to our young people and to their desire for worship. Did you know that some evangelism studies show that approximately 85% of all Christian believers come to Christ before the age of 20? Almost half of the world is under the age of 20. Surely you would agree that a farmer who spends the majority of his labors in a field that only yields 20%, and almost totally ignores a field yielding 80%, is a very foolish farmer. Yet, this is often our approach in the church. Studies show that as high as 70% of high school seniors leave God after graduation. Did you know that the suicide rate in America has nearly quadrupled in the last 30 years? What is discouraging the young? Why do they struggle to reach spiritual commitment and find a faith that will give them hope in their darkest hours? Could it be that our worship services have ritualistically bored them to death and have convinced them that God is too high and His presence too holy for them to come close to Him? If it is the church's responsibility to produce an atmosphere that promotes the "awe!" of God, then every Christian deserves an opportunity to reach this worshipful attitude. Worship services must reach out to all levels of spiritual maturity. My grandmother often reached the level of "awe!" by singing "The Old Rugged Cross." The devotional song, "We Shall Assemble On The Mountain," helps draw me into the presence of God. For children, it may be "Jesus Loves Me" or "The Wise Man Built His House Upon A Rock" complete with hand motions and laughter. But, whatever the age and whomever the person, everyone deserves opportunities to be drawn into the convictions of "awe!" Ancient wording of traditional songs, repetitious orders of worship, old English jargon, monotone sermons, and a host of other man-made limits to true worship have literally murdered our children's desire to approach God. For too many of them, "Awe!" comes not as a response to God's awesome nature, but as an exhale at the end of another yawn. At nearly every speaking engagement, I am approached by a mother who is in tears over her child's decision to leave the church. Some day we will answer for those we have pushed away. Like a bad steward who ignores a field yielding over 80%, God will require an answer for our mismanagement. Many have wrongly concluded that the only way to remedy this situation is to make the worship service into a circus. This author challenges that conclusion. I suggest that our young people are not asking for a circus, they are simply looking for conviction. Young people are interested in spiritual things. They do want to worship. But young people want to do more than just go through the motions. They want to see and experience life-changing worship. For a moment, allow me to be very personal. When was the last time you cried during communion or said “Amen!” after the final verse of “How Great Thou Art”? When was the last time you responded to the invitation and cried publicly about your sin? Conviction is not an option, it is a necessary condition of the heart that leads us into the presence of God. Our young people see too many grandfathers who do not sing during the song service or grandmothers who write their contribution checks while the grape juice is being passed. Too many fathers take time off from work to go on vacation, but refuse to take time off from work to go to church. Too many mothers are more concerned about their child’s homework than they are about their child’s assignments from Sunday school. Do you roast the preacher and grill the elders over Sunday lunch? Is church work your passion or something you endure? The young people are watching. They expect more than just empty words and heartless expressions. Before they give their lives to Jesus, they want to know how He has changed your life. Does it show? Are you convicted? There is no denying the emergency. Just look around you. The statistical nightmare is obvious. We are losing our kids. 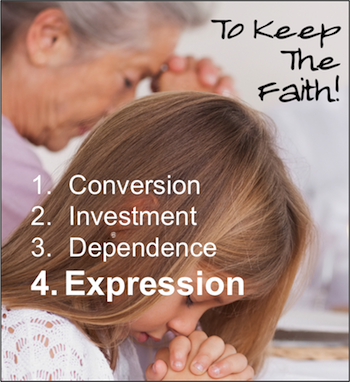 In this study, we have noticed four essential areas to helping our children keep the faith; conversion, investment, dependence and expression. Change must come immediately! But, that being said, it is unrealistic to expect results to come at the same pace. There is no quick fix. It has taken us many years and multiple generations to arrive at such an emergency. It may require the same to get us out. Patience, perseverance, and persistence are essential. It is possible that an entirely new generation of parents and church leaders will need to be trained before hopeful numbers can again be realized. The question is, when will we start this training and who will train them? Answer: A revival among parents and church leaders is our only hope. We must lead if we expect our young people to keep the faith. Back to Top of "Expression: Celebrating Reverent, Relevant, Revealing Worship"